Kiburi: "What were you thinking about, Safura! You're the princess of our pride! You are my sister! From what stupid miracle have you decided to save that stupid Mohatu! Oh, not just stupid! OUR GREATEST ENEMY! Didn't you know that?!" Safura: "I knew, Kiburi. But... He is not stupid. In fact, he is very wise lion and King. I don't understand why do you talk about him like that." Kiburi: "Perfect! Now you protect him! Oh, Safura! I see he had already twisted your brain!" Kiburi: "Ah, surely, I almost believed he hadn't! What did he say to you?" Safura: "Nothing much. He said the things I've been talking for a long time. This war is useless we have to stop it, Kiburi. We could make them allies in the war against hyenas!" Kiburi: "You're girl, you understand nothing." Safura: "What don't I understand?!" Kiburi: "I have nothing to talk with you on this topic! You can go! And don't even try to meet with him again, Safura! I warned you! And don't think to flee! I have already took care so that my most loyal lioness watched you all the time and you couldn't run away! So that I could prepare the final battle!" Kiburi: "Yes, my sweetie sister! I wish you never met Mohatu, because his end is coming!" Safura: "No! Why are you so selfish?!" Kiburi: "I'm not selfish! I think what is better to you!" Safura: "No, you think only about yourself and your power! I don't see you care about me!" There was a war for the Pridelands between two young Kings: Mohatu (the true heir to the throne) and Kiburi (the King of the pride, which came from far lands and decided to take over the Pridelands). Kiburi had a very beautiful sister, princess Safura. She was very sweet, gentle, generous lioness with a very good heart. One evening after one of a really big battles Safura accidentally stumbled upon the wounded Mohatu. She knew he was her enemy, but she felt she couldn't left him. Safura cured and saved Mohatu. After a lot of talks she realized that he wasn't evil and cruel enemy. She found him being very nice, friendly, wise and sympathetic lion. Mohatu liked Safura immediately. Soon they fell in love. When Kiburi learned that his sister saved his enemy he got really mad. He established tight control of her every move and forbade her to meet with Mohatu. Luckily, Mohatu's pride won the war. Being very good lion he didn't banish Kiburi as he loved Safura and didn't want to make her fell sad. Mohatu married Safura and she became his Queen. Everyone was surprised when Kiburi quickly became friends with the lion he named his enemy before. 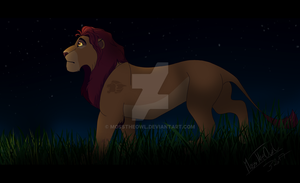 As the older brother of the Queen Kiburi became the Leader of the Lion Guard because Mohatu didn't have any siblings. However, Kiburi didn't have the blood of the Pridelands' kings, so he didn't receive the Roar of the Elders. He was very loyal to King Mohatu and became his best friend. Soon Mohatu and Safura had two sons: Ahadi and Ntaba. Unfortunately, Safura died in a battle with hyenas. Mohatu was really mad. He was as angry as never before. He banished hyenas from the Pridelands. Kiburi tried to take revenge for his sister but hyenas had great numerical superiority and Kiburi was also killed. 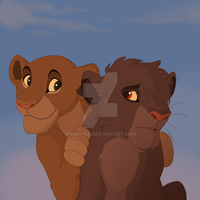 After the two princes grew up Kiburi's place was taken by Mohatu's younger son Ntaba, who became the new leader of the Lion Guard. So, here is Kiburi (the selfish lion) and his sister Safura. I love the stories where seemingly bad guys redeem themselves at the end. It is one of my most favorite character arcs out there : ) It may seem simplistic on the surface, but there is actually much more to it.